During the excavation, carried out as part of the Jezreel Valley Railway Project between Ha-‘Emekim Junction and Yagur Junction, remains of the oldest kilns in Israel were discovered where commercial quantities of raw glass were produced. These kilns, c. 1,600 years old (dating to the Late Roman period), indicate that the Land of Israel was one of the foremost centers for glass production in the ancient world. According to Yael Gorin-Rosen, head curator of the Israel Antiquities Authority Glass Department, “This is a very important discovery with implications regarding the history of the glass industry both in Israel and in the entire ancient world. We know from historical sources dating to the Roman period that the Valley of ‘Akko was renowned for the excellent quality sand located there, which was highly suitable for the manufacture of glass. Chemical analyses conducted on glass vessels from this period which were discovered until now at sites in Europe and in shipwrecks in the Mediterranean basin have shown that the source of the glass is from our region. Now, for the first time, the kilns have been found where the raw material was manufactured that was used to produce this glassware”. The excavation of the kilns has caused great excitement in recent weeks among glass researchers throughout the world, some of whom have come especially to Israel in order to see this discovery first hand. According to Professor Ian Freestone of the University College London, who specializes in identifying the chemical composition of glass, “This is a sensational discovery and it is of great significance for understanding the entire system of the glass trade in antiquity. This is evidence that Israel constituted a production center on an international scale; hence its glassware was widely distributed throughout the Mediterranean and Europe”. This enormously important site was discovered by chance last summer by archaeologist Abdel Al-Salam Sa‘id, an inspector with the Israel Antiquities Authority. While overseeing infrastructure work being conducted on the new railway line from Haifa to the east, he suddenly observed chunks of glass, a floor and an ash layer inside a trench. He halted construction work at the site and began preparations for an archaeological excavation, the important results of which are now evident. According to Abdel Al-Salam Sa‘id, the excavation direction, “We exposed fragments of floors, pieces of vitrified bricks from the walls and ceiling of the kilns, and clean raw glass chips. We were absolutely overwhelmed with excitement when we understood the great significance of the finds”. The kilns that were revealed consisted of two built compartments: a firebox where kindling was burnt to create a very high temperature, and a melting chamber – in which the raw materials for the glass (clean beach sand and salt) were inserted and melted together at a temperature of c. 1,200 C degrees. The glass was thus heated for a week or two until enormous chunks of raw glass were produced, some of which weighed in excess of ten tons. At the end of the manufacturing process the kilns were cooled; the large glass chunks that were manufactured were broken into smaller pieces and were sold to workshops where they were melted again in order to produce glassware. During the Early Roman period the use of glass greatly expanded due to its characteristics: its transparency, beauty, the delicacy of the vessels and the speed with which they could be produced by blowing – an inexpensive technique adopted at the time that lowered production costs. Glass was used in almost every household from the Roman period onward, and it was also utilized in the construction of public buildings in the form of windows, mosaics and lighting fixtures. Consequently, large quantities of raw glass were required which were prepared on an industrial scale in specialized centers. The installation that was discovered in the excavation is an example of one of these ancient production facilities. According to a price edict circulated by the Roman emperor Diocletian in the early fourth century CE, there were two kinds of glass: the first was known as Judean glass (from the Land of Israel) and the second – Alexandrian glass (from Alexandria, Egypt). Judean glass was a light green color and less expensive than Egyptian glass. The question was: Where were the centers that manufactured this Judean glass that was a branded product known throughout the Roman Empire and whose price was engraved on stone tablets so as to ensure fair trade. The current discovery completes the missing link in the research and indicates the location where the famous Judean glass was produced. In a few months time the public will be able to see this discovery first-hand when it will be exhibited at the “Carmel Zvulun” Regional High school, in the Zevulun Regional Council. 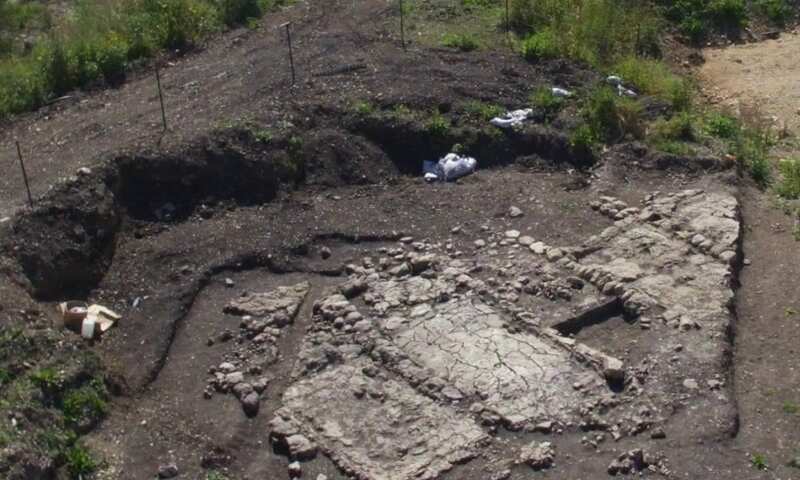 Glass production kilns that date to the sixth or early seventh century CE were previously found at Apollonia in Herzliya and are c. 200 years later than the current discovery. The largest glass production facility from antiquity that has been found so far was exposed in the Bet Eliezer neighborhood in Hadera where it was dated to the seventh–eighth centuries CE, and the latest evidence we have of glass production in the country was revealed at Bet She‘arim (next to Khirbat ‘Asafna), dated to the late eighth and early ninth centuries CE. The kilns that were just recently found are the earliest ones to be discovered so far in Israel. Their relatively good state of preservation will make it possible to better understand the production process. Researchers now hope that by means of its chemical composition they will be able to trace the export of the glass throughout the Roman Empire. The raw glass industry at Khirbat ‘Asafna was part of an extensive industrial zone where there were oil presses, wine presses and a glassware workshop which was excavated in the 1960’s by an American archaeological expedition.